Roger gave this great movie 3 stars in his review, but I don't think that was good enough. In his At The Movies review Roger said that "I'm recommending it but not necessarily at the high levels of praise that you're (Gene) giving it". In his written review Roger says "The Last of the Mohicans is not as authentic and uncompromised as it claims to be -- more of a matinee fantasy than it wants to admit -- but it is probably more entertaining as a result." He compares it unfavorably with the "visual picture" presented by Black Robe, which he had given a thumbs down to the year before. Roger, you can't have it both ways. Black Robe is too realistic and this movie is not real enough. They were actually, both in their own way, great movies. They both accomplished what they set out to do and they both did it very well. 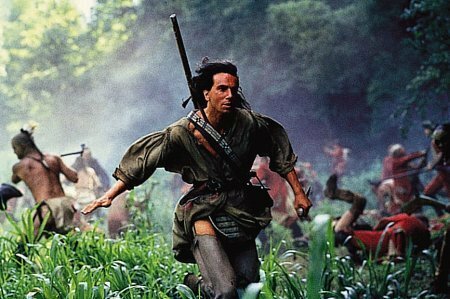 The Last of the Mohicans is one of my favorite movies of all time and I think it is a great, not just a good, movie. This version of the movie is made all the more interesting by Wes Studi's great role as Magua, where he can viewed as a tragic heroic figure. 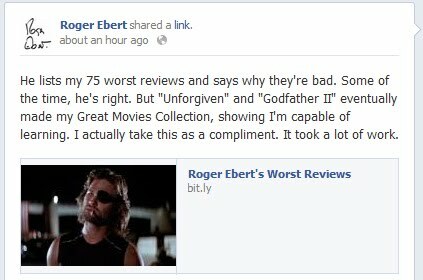 I'm afraid I lean toward Ebert's view on this one. after the hero says to his love: "Stay alive! no matter how long it takes... I will find you!" it suggests a lot more adversity is ahead than we see in the movie. that made a letdown for me. Hi, my name is Jack and I am going to keep a list of what I think are some of the worst reviews of Roger Ebert, the best movie reviewer of all time. Roger had weak reviews on three movies in the AFI Top 100 (Unforgiven, Godfather 2, and A Clockwork Orange). He also had a bad review on what I think is the best science fiction movie ever made, Blade Runner. As Osgood Fielding III said "Well, nobody's perfect! ", not even Roger.